Georgetown gas motorhomes by Forest River offer you complete and total luxury while traveling on the road. From the plush interior to the powerful engine, you can’t go wrong with Georgetown. And, because these come with the stamp of quality Forest River is known for, you can rest confident this motorhome will last for years and years to come. Georgetown comes standard with a seamless wrap over fiberglass roof, slam latch baggage doors, fog lights and soft touch driver passenger seats that guarantee getting to you destination will be just as enjoyable as being at your destination. An LED map, A huge 30″ entry door (N/A 270) is welcome and makes loading and unloading this RV incredibly easy. The floor throughout is completely flat, which adds to the safety of the inside. The kitchen is luxurious and boasts gorgeous solid surface countertops that are durable and guaranteed to last for years. An undermount stainless steel kitchen sink is deep and makes cleaning up super easy, while the slide out pantry promises plenty of storage for all of your favorite items. A 30″ over the range microwave, three burner range and large refrigerator equip you with everything needed to create delicious meals. Depending on the floorplan you purchase, the Georgetown comes with either a 32″ or 40″ TV and a Soft Touch hide-a-bed sofa. So, whether you want to kick back and relax while reading a book or watch your favorite movie, you will totally enjoy vacationing in Georgetown. 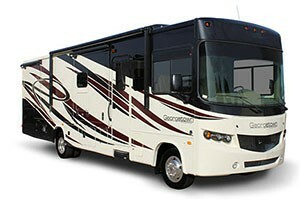 Check out our selection of Georgetown motorhomes or stop by and walk through available units. We’re here to answer any questions you have and make sure you find the best RV for your needs.